April 22 is the feast of St. Caius, pope. 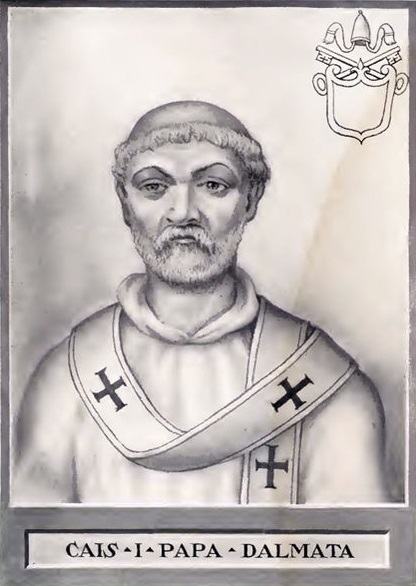 Pope Caius or Gaius (San Caio) was the 28th Bishop of Rome and Pope of the Catholic Church. According to tradition he was born in Salona, capital of Dalmatia, to a noble Roman family. 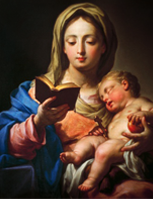 Tradition makes him an uncle of the Roman martyr St. Susanna, a brother of St. Gabinius, and a cousin of Emperor Diocletian. This latter fact may explain why many Christians were employed at the imperial court and why the Diocletianic Persecution did not begin until a few years after the Pontiff's death. According to the Liberian Catalogue he reigned as pope for twelve years, four months and seven days, from December 17, 283 to April 22, 296 AD. 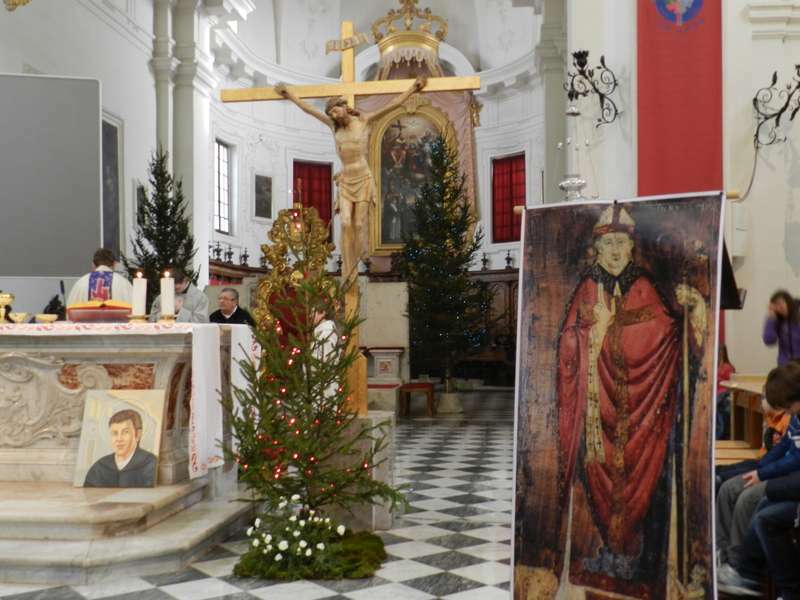 He is said to have baptized the men and women who had been converted to Christianity by St. Tiburtius. 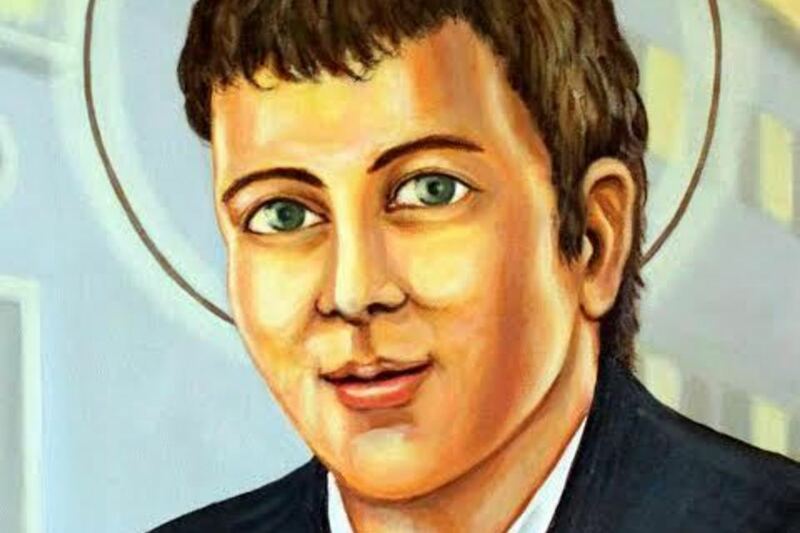 Previously he was thought to have been a martyr, but now is thought to have died of other causes. Nothing else is known of his life. He was buried in the Catacomb of Callixtus. The ancient tomb of Caius, with the original epitaph, was discovered in the 19th century by Italian archaeologist Giovanni Battista de Rossi. 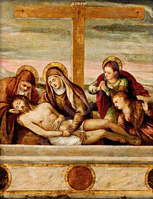 In 1880 his relics were transferred to the private chapel of the Barberini family. He appears in the Roman Martyrology alongside Pope St. Soterius. Historically his cult was particularly strong in Dalmatia and Venice. April 11 is the feast of St. Domnius, bishop and martyr. St. Domnius (San Doimo or Domnione di Salona) was a Roman bishop who from about 284-304 AD was the second Bishop of Salona. St. Domnius was born in the Roman colony of Antioch, capital of the Province of Syria-Coele. According to tradition his father Theodosius was a wealthy Roman and his mother Migdonia was of Greek origin. Domnius later moved to Salona, which at that time was a large Roman city and the capital of the Province of Dalmatia. He worked there as a missionary and in c. 284 AD he became bishop of that city, succeeding St. Venantius. In 303 or 304 AD, during the height of the Diocletianic Persecution, he was beheaded, suffering martyrdom together with seven other Christians. He was buried outside the city walls by Roman soldiers. After the legalization of Christianity by the Edict of Milan in 313 AD, a chapel was erected on his grave. It later became a church and in the 5th century was converted into a large basilica. The Avars and Slavs began to invade the Province of Dalmatia in the 7th century, and in 639 AD they sacked and completely destroyed the city of Salona. The surviving Roman inhabitants fled to the nearby coast, where they barricaded themselves behind the walls of Diocletian's Palace. Within these walls a new city was established: the city of Spalato. The Romans had brought with them the relics of St. Domnius. He became the patron saint of the new city and his relics were preserved inside a new church which they dedicated to him: the Cathedral of San Doimo – providentially built inside the Mausoleum of the very emperor who had caused the saint's death. 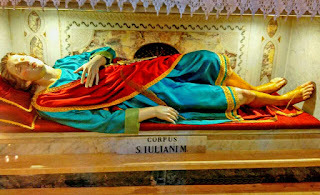 In 641 AD Pope John IV requested that St. Domnius' relics be transferred to the Lateran Basilica in Rome, in order to protect them from the Slavic invaders. A portion of the relics were later returned to Spalato, while the rest remained in the Lateran. 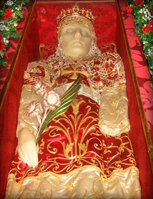 Today both Spalato and Rome each possess some of the saint's relics. In Spalato the feast is celebrated on May 7, instead of the usual April 11; the date was moved forward in the diocese of Spalato due to the feast often coinciding with Palm Sunday. This is a claim that has been made every year around the time of the Day of Remembrance for the last decade, repeated like a mantra by the media of our country, which is controlled by a well-defined school of thought. In essence, they claim that the anti-Italian violence by Tito's Slavs was perhaps a bit much, but was caused by the violence and oppression of the occupying Italian army. These claims demonstrate their ignorance – their ignorance of the history of Istria and Dalmatia. These lands were never divorced from Italian history, as we shall see, but rightfully belong to our national history, no less so than all the other current regions of Italy. What Tito did was only the final act of a process that began in 1860, and quite frankly the Communist ideology professed by Tito was not the triggering factor; if anything it was the ideological glue that held the Slavic peoples (Slovenes, Serbs, Croats) together in their anti-Italian operation. The history of those lands, which were Roman and then Venetian for nearly a thousand years, is part of the history of our Fatherland and should be studied in schools in all grades. But today it is forgotten history, indeed its history is unacknowledged and hidden. That is why, for example, nothing is ever said about what took place in Istria and Dalmatia between the time of the Risorgimento and the First World War. That is why they fail to teach and explain that the methods used by the Italian government from 1918 to 1945 (the famous compulsory use of the Italian language in schools, the supposed “italianization” of surnames and violence during the war), although considered wrong by people today, were not considered wrong according to the mentality of the time; during that time these policies were regarded as the only feasible way to repair the injustices suffered by Italians in previous decades. Remember, nothing ever happens for no reason. In order to discuss the origin of the conflict between the nationalities in these areas it is first necessary to give a basic account of Dalmatian history, from the beginning. Ancient Dalmatia, called “Illyria”, entered history beginning in 156 BC with the first of eight wars that were waged against Rome. Dalmatia became a senatorial province in 27 BC and later an imperial province. It was fully integrated with the Roman world and was the birthplace of Roman Emperors like Probus, Claudius, Carus and Diocletian. The entire Dalmatian coast and islands were Latinized by the Romans who founded cities and favored a fusion with the native Illyrian element. In 475 A.D. Emperor Julius Nepos took refuge in Dalmatia, while Romulus Augustulus was raised to the purple in Ravenna. In 476 A.D. the latter was deposed by Odoacer and the Western Roman Empire ceased to exist. But Julius Nepos survived in Dalmatia with the Emperor's insignia and remained a representative of Roman world until 480, the year of his death. In the seventh century A.D., the barbarian invasions began. In particular, the Avars invaded the Balkans with their slaves, the Slavic tribes, and later invaded the Adriatic coast. The Latin people then retreated to the fortified towns of Dalmatia. As the Slavs advanced towards Zara and Spalato, municipalities arose in the Roman cities of Dalmatia with characteristics similar to those existing in the Italian peninsula. The Slavs eventually reached the sea along the Velebit channel and occupied the the mouths of the Narenta river where they devoted themselves to piracy. The Dalmatian cities sought help from the rising Venetian power; seeing as its trade was threatened, Venice decided to intervene. On Ascension Day in the year 1000, after refusing to pay the pretium pacis to the Croats, i.e. a tax to avoid attacks on Venetian convoys, the Doge Pietro Orseolo II set sail for Dalmatia with his ships and his warriors, obtained an oath of submission from all the Latin cities, and defeated the Croatian pirates everywhere, reaching down to Spalato and Curzola. This was an historical act of immense importance. Venice would forever consider it a perpetual and inalienable acquisition and one of the fundamental cornerstones of its statal right. 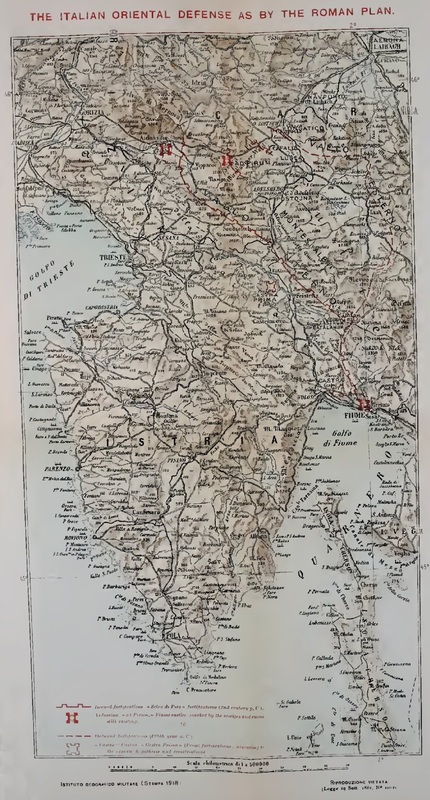 From then on until 1797, with some losses and re-conquests, the submission of the Latin cities was uninterrupted, and since the fifteenth century all of Dalmatia became an integral part of the Venetian “Stato da Mar”. 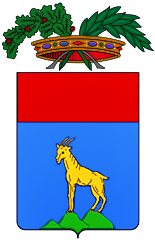 Cities such as Zara, Spalato, Traù, Sebenico, Cattaro, Ragusa (the modern Dubrovnik, which was the 5th Italian maritime republic after becoming independent from Venice), islands such as Curzola, Lissa, Lesina, Brazza, Meleda and a hundred other towns of Dalmatia still carry the signs of Venetian culture and political presence today in their urban layout, artistic and military monuments, palaces and streets. The Slavs were never able to impose their language on the Dalmatians, whose language was a vernacular derivative of Latin known as Dalmatico. In the fourteenth century the Dalmatian language was gradually replaced by Venetian, which became the official language of the region and the language of culture. 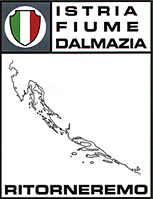 Until the fall of the Republic on May 12, 1797, Dalmatia flourished in institutions, in the arts, in culture and in commercial activities under the Venetian banner. Even the Slavic-Croatian element, invited by the Venetians to repopulate the countryside affected by the plague, peacefully coexisted for centuries with the Latin element, sharing uses and customs; even the language spoken by the Slavs on the coast from Fiume to Spalato, known as “chakavian”, a special variety of language distinct from Croatian, is rich in Venetian words that are unknown to the Croats of Zagreb. These new “Dalmatian Slavs” (peasants, sailors, fishermen), who were in contact with the Latin element, are anthropologically “Mediterranean”. The most loyal Slavs, the Oltremarini, were the last troops to leave Venice after the fall of the Republic. The Morlochs of Latin blood, pastores Romanorum, for centuries fought under the banner of San Marco and the Stratioti (mercenaries) which provided light cavalry to Venice were used against the Turks. All felt united and protected under the wings of the Venetian Lion. 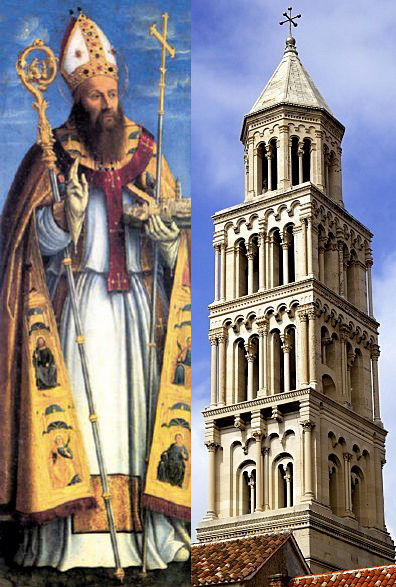 Just as the Roman Empire survived in Dalmatia even after 476 A.D., so the Venetian Signoria continued on in Dalmatia for some time after the fall of the Republic. In Zara the flag of San Marco was lowered on July 1, brought to the Cathedral, kissed and bathed in tears by the people. The last and most poignant farewell was given on August 23 by the inhabitants of the town of Perasto, bearer of the battle flag of the Venetian fleet, in the Bay of Cattaro. With the Treaty of Campo Formio, Dalmatia was sold by Napoleon to Austria, but a few years later, in 1806, Dalmatia returned to the Kingdom of Italy, together with Istria. Later, after a few decades marked by bitter disputes, the region returned to Austria again. And so we come to 1815, the year in which we can date the beginning of the Risorgimento, also in Dalmatia. The Austrian police immediately realized that the Italian citizens supported the ideas of independence and reunification with Italy. They discovered Carbonari lodges, and later, in 1830, found supporters of Mazzini's Young Italy movement. It was in 1847 that Nicolò Tommaseo of Sebenico entered the history of Dalmatia. Adhering to the opinions of Mazzini, he advocated the destruction of the Habsburg Empire and the resurrection of nationalities. The Dalmatians pursued camaraderie with the Slavs and therefore multiplied the initiatives of scientists, scholars, jurists. But, when the uprisings broke out in 1848, the Croats remained indifferent because they were pursuing the consolidation of the Habsburg dynasty through a Croatian movement that they hoped would become a pillar of the Empire's strength. The Croats thus became the military arm of Austrian absolutism and they aspired, as part of the Empire, to annex Dalmatia to Croatia. Now, Dalmatia in 1848 was nationally the same as how Venice left it. Up to that point Dalmatia had been preserved by Austria: it was totally Italian in culture, in administration, in its ecclesiastical hierarchy, in wealth, in commerce, in navigation, in artisanry. Austria never changed the names of the cities, islands, mountains or rivers. These names remained Italian under Austria for 120 years because they had existed for tens of centuries. But the Italian element, in the eyes of the imperialists, represented an element whose loyalty to the Empire was questionable. The sea was the only thing that separated the Dalmatians from their Italian Motherland and Austria was well aware of this. In early March of 1848 Milan, Venice, Zara, Sebenico and Spalato revolted together. The swift Austrian suppression nipped in the bud any possibility of success. The Dalmatian cities were surrounded by Austro-Croatian troops and the Croatian peasants of the countryside were armed and incited against the Dalmatians. They were also incited by the Croatian clergy, who depicted the Italians as godless Freemasons. On the political plane the Croats of Zagreb began to require a pledge of their loyalty to the Empire and openly demanded the annexation of Dalmatia to Croatia. In 1860, after years of Croatian attempts and strenuous opposition by the Dalmatians (it is sufficient to recall Spalato's response to a letter sent by Zagreb proposing annexation: “Dalmatia is Italian: only one citizen of Spalato, out of 12,000, was able to translate your honorable words [from Croatian]”), the Croats, supported by the Empire, proclaimed the forced annexation of Dalmatia to Croatia. The elections of a Diet of Dalmatia to be sent to Zagreb were held and the ballot boxes gave 29 Italian representatives and 12 Croats. But the majority of the Diet refused to go to Zagreb. The Croatian delegates departed for Zagreb to join the Croatian delegation which soon left for Vienna. To counter the Croats, the Diet of Dalmatia, all in unison and guided by the ailing Archbishop of Zara Giuseppe Godeassi, left for Vienna and was received on May 8 by Emperor Franz Joseph, who realized the adamant will of the Dalmatians to remain autonomous from Zagreb. No one spoke of annexation to Croatia any longer. But this victory was not attained without sacrifice: Archbishop Godeassi returned to his homeland in agony and died on September 5. Unfortunately, the slow and inexorable operation of croatizing Dalmatia continued. On June 15, 1866 an imperial ordinance limited the use of the Italian language in offices and forced officials to learn Croatian. On June 14, 1867 another decree ordered the Slavicization of the grammar school in Zara; in the same year there were the first anti-Italian street riots provoked by masses of Slavic peasants; citizens were forbidden access to the countryside; the Italian landowners had their vines chopped, trees cut down, crops stolen; the Croatian friars in Signo refused to administer the sacraments to the Italian population. In Sebenico on July 31, 1869 a Croatian mob attacked and killed 14 sailors of the Royal Italian ship Monzambano which was anchored in the port of the Dalmatian city. On February 15, 1870 the Croats attempted to set fire to the Verdi Theatre of Zara, a temple of Italian art. All of these incidents led to the first exodus of the Dalmatian population towards Zara, Istria and the Italian Motherland. 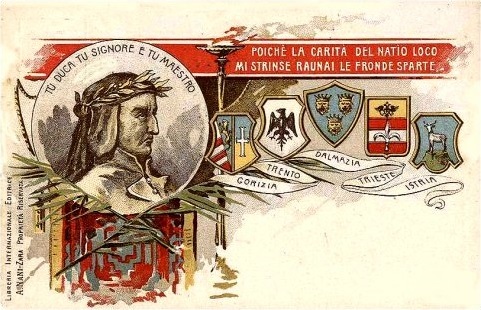 Croatian Slavic irredentism, which aimed at annexing Dalmatia to Croatia, thus was able in such a short time to destroy centuries of peaceful coexistence guaranteed by the good governance of the Republic of San Marco. This position of Italy rekindled the hopes of the Italians of Dalmatia, despite the difficulties due to the daily harassment they suffered, so much so that the Italian Chamber of Deputies burst into uncontrollable applause during the communication of the greeting and thanksgiving from the city of Zara. 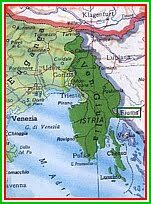 Trento, Trieste, Istria, Gorizia and Zara were the names of the places that needed to be liberated and were on the lips of every Italian irredentist. 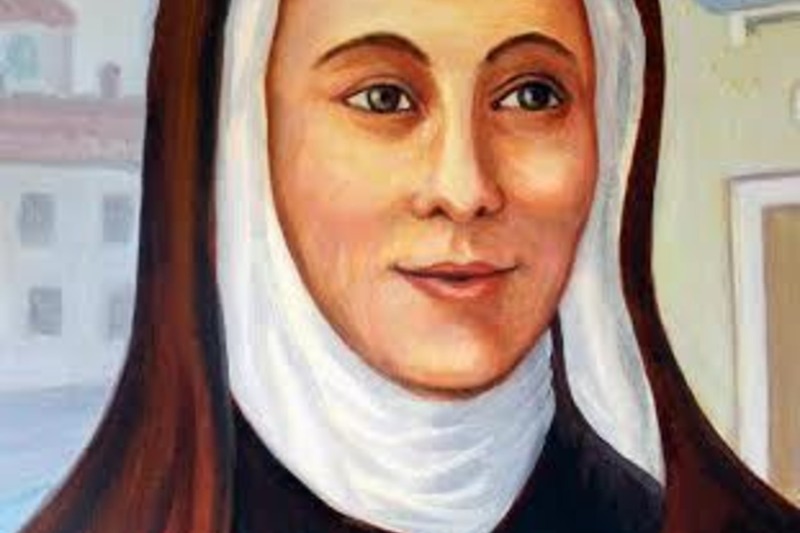 But forty-eight long years passed before part of Dalmatia was finally reunited with the Italian Motherland. Meanwhile the Austrians inexorably continued the forced Croatization of Dalmatia. It began with threats and abuses to change the balance of power within the provincial Diet: more power was given to Croatian politicians and less to Italians, which brought about a reversal of the anti-annexation results of 1860; now there was a new 24 to 16 majority in favor of the Croatian annexationists. By means of electoral fraud, violence, corruption and intimidation, one by one the Italian cities of Dalmatia fell. The offices, schools, churches and all public institutions were then Croatized, always with the consent of the Austrians. This situation dragged on through thick and thin until the eve of the First World War, but with a constant progressive loss by the Italian Dalmatians, as if it were a battle in retreat, slow and tenacious but forced to surrender the land inch by inch. In the provincial Diet – where until 1865 the discussions were held only in Italian – from 1866 onward Croatian was gradually imposed alongside the Italian language until 1883, when the use of the Croatian language was made exclusive and Italian was forcibly excluded. This early slow and steady ethnic cleansing paved the way for Italy's re-Italianization policy in the years following World War I, when a few parts of Dalmatia passed to the Italian State after the fall of the Austro-Hungarian Empire. Cherso, Lussino, Zara and the islands of Lagosta and Pelagosa were restored to Italy. But the majority of Dalmatian territory, including the islands, came under the rule of the newly-formed Kingdom of Yugoslavia on the basis of the Treaty of Rapallo (November 12, 1920). “Certainly the Treaty of Rapallo will be judged by history, but we can determine right now that this treaty has consumed a historical event of great importance and laid the seeds of endless troubles in a soil too fertile. After twelve centuries of slow advance and four centuries of struggle with the Italian race, the Slavic race was able to obtain from Italy, in an official document – the first in history – the recognition of its undisputed dominion on the east side of the Adriatic. This historical fact is consumated by the Treaty of Rapallo. Using the lesson of history, allow me to make some predictions. All of modern history indicates a strong movement of expansion of the Slavic race in all directions. As serfs, slaves, mercenaries, feudatories, they will expand westward, penetrate the boundaries of various neighboring nationalities and will replace the populations. The Slavicization of Dalmatia and the gradual expulsion of the Italian element thus become a fait accompli. All this was before the advent of the Fascist regime, before the attempted re-Italianization of these lands by the Italians (1918-1941), and before the Italo-German military occupation of World War II. The poisonous seeds of ethnic hatred had certainly been planted, as can be seen, not by the Italians, but by the Slavs, and the plants unfortunately grew between 1943 and 1945 with the tragedy of the Foibe Massacres and the final exodus of the Italians in the years after. The nationalisms that caused the collapse of the Central Powers were unable to reconstruct that centuries-old peaceful coexistence among the people of Dalmatia which the Republic of Venice had managed to wisely guarantee from the fourteenth century until its fall. A peaceful coexistence which still remains as a witness and example for all generations. Of the many thousands of travellers who annually spend a few weeks in Venice, who know the towns of the Venetian mainland as well as those of their own country, only a very small proportion push on a little further and visit the former territory of the Venetian Republic on that wonderful Eastern coast of the Adriatic. There a group of towns may be seen, thoroughly Italian in character, which once formed one of the chief bulwarks of Christendom against the advancing Turk. Dalmatia is full of interest for the historian, for the artist, for the lover of natural beauty, and for the student of political affairs. The importance of the Dalmatian cities in European history is greater than one generally realises, for whether as independent communes or under Hungarian or Venetian rule, they constituted a most formidable obstacle to the tide of Turkish invasion. When all the interior, far to the north, had succumbed before the Moslem conqueror, when Hungary was a Turkish province and Vienna itself was threatened, these little coast towns still held out bravely for Christianity and civilisation. They were ever a thorn in the side of the Turkish Sultans, and they contributed in no small degree in preventing them from invading Italy, the land which, above all others, they desired to conquer. The rest of Europe is under a debt of gratitude to these poor, half-forgotten townships of the Dalmatian Littoral. 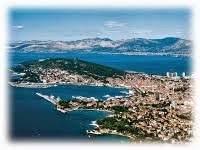 A tour in Dalmatia may now be accomplished with little expense and no great discomfort. 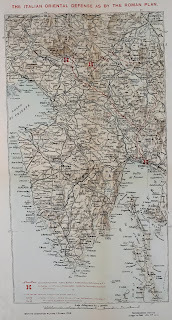 There are numerous good steamers plying between Trieste or Fiume and Cattaro, touching at most of the towns, one or two railways into the interior, and good carriage roads. The hotels, with the exception of the “Impérial,” at Ragusa, are somewhat primitive, but not impossible. One of the first impressions which Dalmatia makes upon us is the violent contrast between the towns and the country. In few other lands is this difference so marked. The coast towns might be little pieces of Italy, fragments of Venice, for the mother-city left her impress on her colonies in the most unmistakable way. The buildings are Roman, Byzantine, Romanesque, Venetian Gothic, and in the Renaissance style. There is the same café life with which all who know Italy are familiar – the crowds within the café, or sitting round small tables in the piazza outside, sipping their vermouth or their maraschino and reading the papers. 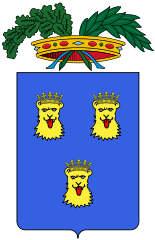 The language spoken by the people is to a great extent Italian, especially at Zara, and it is pronounced with the soft lisping Venetian accent. Another thoroughly Venetian feature is that in no Dalmatian town, save Ragusa, are carriages seen in the streets, which are narrow and not constructed for wheeled traffic. Outside the harbours flocks of gaily-painted Venetian sails add still another Venetian touch. The country people, too, are very different from the town dwellers. The former are entirely of Slavonic origin, and wear the most wonderfully brilliant costumes. Their language is Serbo-Croatian, and the majority of them speak no Italian at all. At the present moment there is a fierce struggle raging between the Slaves and the Latins of Dalmatia. The Slaves are gradually penetrating into the towns, and banishing wherever they can the Italian language. Zara alone has remained quite an Italian town. Everywhere else the Slaves are in a majority. Sebenico, Spalato, Traù, Ragusa are no longer known by their historic Italian names, but have been turned into Sibenik, Spljet, Trogir, Dubrovnik. The names of the streets have undergone the same translation, and the Piazza dei Signori has become the Gospodski Trg. It is a pity to see these interesting islands of Latin civilisation being gradually absorbed by the advancing tide of Slavonic invasion. With their glorious past they seemed destined to a better fate. Zara, the capital of the whole province, is its northernmost town, and is usually one's first stopping-place. And it is a good place to begin with, for it sums up all the most characteristic features of Dalmatia. 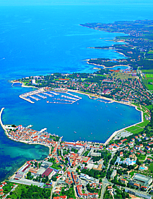 Built on a promontory stretching out towards the north-west in the midst of an island-studded sea, with Ugliano and Pasman to the west and the hazy blue snow-capped range of the Croatian Velebit to the east, its situation is unrivalled. Zara has two harbours, the old harbour ensconced in a bay, the other formed by the fine new piers. The town was formerly an almost impregnable fortress, and parts of the mighty bastions are still left. The channel which separated it from the mainland has now been partially filled up, and the outer bastion beyond turned into a pleasure garden. One gate alone communicates with the mainland—the Porta di Terraferma. It is a handsome but simple piece of architecture by Sammichieli, consisting of a broad central arch surmounted by the ubiquitous lion of St. Mark, and two lateral doorways of rusticated Doric. On two sides of the town there are broad quays, but inside the streets are narrow, and, as we have said, closed to wheeled traffic. Among its architectural remains there are examples of all the styles found in Dalmatia, bearing witness to its many different rulers. Two fine Corinthian columns, one in the Piazza delle Erbe and one in the Piazza San Simeone, and some fragments of arches and temples are Roman work. The curious round church of San Donato reminds one of Byzantine Ravenna. This church is the most curious edifice in Zara. Built in the ninth century by a certain Bishop Donatus in imitation of San Vitale at Ravenna and of the Cathedral of Aix-la-Chappelle; it is now turned into a museum. But in making excavations beneath it, it was discovered that not only had the Roman fragments been let into the walls, but that beautiful Roman columns had been cut into sections and laid lengthways to serve as foundations for the Christian church, the rude work of the early Middle Ages! A striking example, as Mr. Graham Jackson observes, of the triumph of spiritual over temporal pride. The Duomo is a fine specimen of Romanesque work, and the facade, with its rows of small arches, recalls the churches of Pisa or Lucca. An effective contrast is produced by the simplicity of the lower part of this facade with the elaborate ornamentation of the upper. San Grisogono is another exquisite piece of Romanesque work. Santa Maria has been rebuilt in the Renaissance style of the Lombardi. The public buildings and private palaces are mostly in the best style of Venetian Gothic, with the familiar pointed arches and elaborately carved balconies. Zara cannot boast of many pictures as compared with Italian towns, but it possesses examples of several Venetian artists, and one work which may claim to rank as a masterpiece—the early Carpaccio in the church of San Francesco. It is an Assumption of the Virgin in the midst of a host of saints and angels. The costumes are of a rare brilliance, and the landscape of little green hills crowned with castles is in the master's best manner. In the middle a small Lombard church, through the open door, of which glitters a golden altar. But unfortunately the painting is in a most deplorable condition, and unless promptly attended to it will soon fall to pieces. The rich costumes of the Morlak peasantry lend a touch of the East to the town, and proclaim that we are not in Italy. The men wear small red and black caps, red waistcoats, dark brown jackets with crimson facings, blue trousers elaborately embroidered, sometimes red and yellow leggings, and curious boat-like shoes called opankas. The women's costume is less becoming. 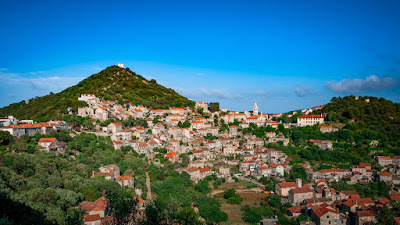 Sebenico is the most thoroughly Venetian town (as far as architecture is concerned) in Dalmatia. It is situated on a steep hill overlooking a rocky landlocked bay, with one narrow opening to the sea guarded by a Venetian castle. To the North the bay penetrates still further inland, forming a sort of fjord fed by the river Kerka. The hill on which the town is built has on its summit a splendid mediaeval castle, the walls of which creep right down to the sea. Behind are two other castles of a later date, the three being known as the Castelli del Barone, after Baron Degenfeld, who defended them successfully against the Turks in 1647. The principal building in Sebenico is the cathedral, one of the most perfect specimens of Renaissance architecture in existence. It was built in two periods, the earlier showing traces of Romanesque influence. The simplicity of the plan, the great height of the vaults, and the elevation of the choir, produce an impression of extraordinary grandeur and spaciousness. It has the peculiarity, too, of being one of the largest churches in Europe, according to Mr. Graham Jackson, in which neither timber nor brick is employed. All is of squared stone, marble, and metal. The bold waggon roof is of stone without beams or leads. Even the beautiful choir stalls are of marble. The whole building is full of beautiful details, marble balustrades, exquisite stone carving, and elaborate galleries. The baptistry is a jewel of sculptured marble. There are no other churches of any importance in Sebenico; but the steep and tortuous streets, the quaint archways, the handsome Venetian doorways charged with well-designed heraldry, the town walls, and the massive towers, form a most fascinating ensemble. From some gloomy courtyard in a half-ruined palazzo one may issue forth on to a neglected terraced garden all sunshine, overlooking the azure bay, the lilac rocks which enclose it, the picturesque fishing boats, the heavy Lloyd steamer, and the smart Austrian corvette floating on its waters. Sebenico is a good starting-point for an expedition into inland Dalmatia, as there is a railway to Knin. The latter is a curious little town, quite Slavonic in character, on the banks of the Kerka, protected by a huge castle built by the Venetians as a bulwark against Turkish raids, and the scene of many fights between Christian and Moslem. The scenery is very different from that of the coast, for while the former is stony and treeless, round Knin and Drnis there are fertile well-watered plains and wooded hills. From Knin roads lead to all parts of Dalmatia and beyond the Dinara range into Bosnia. From Sebenico the steamer follows a channel between the mainland and a chain of islands to Spalato, the ancient Aspalatum, is the largest and most flourishing town in Dalmatia, but its chief interest for the traveller lies in the ruins of the world-renowned palace of Diocletian. Formerly the whole town was contained within the four walls of the vast edifice, but it has subsequently spread out beyond them. The palace itself from an aesthetic point of view is somewhat disappointing. The architecture is clumsy and thoroughly decadent, and while numbers of small houses have filled up the interstices of the colonnades and porticoes, the few open spaces are encumbered with immense scaffoldings, as parts of the building are being restored. But it is highly interesting for the archaeologist and the architect. It is the most complete specimen of Roman domestic architecture in existence, and in the irregularities of the classic work we find the beginnings of the Byzantine and Romanesque styles. The finest parts of the building are its walls; the wide sea front with its stately colonnade is imposing and grand, and the enormous size of this pleasure-house cannot fail to impress one. There are some fine details of Byzantine work in the Duomo (the old temple of Jupiter) and in the Baptistery, also a temple. The mediaeval and Venetian buildings, although picturesque, are in no way remarkable. The environs of Spalato offer many attractive excursions of which the most beautiful is the drive along the Riviera dei Sette Castelli to Traù. This riviera is with one exception the most fertile stretch of the Dalmatian coast, for although the mountains behind are bleak and bare, the land between them and the sea is cowered with luxuriant vegetation; olives, vineyards, cactus, fruit-trees grow in abundance, and the whole scene with the grey heights of Mossor on one side and the sapphire island-studded sea on the other is of singular beauty. The Croatian peasantry are a curious feature. One sees men in the gay national costume riding sideways on diminutive donkeys, each leading a small lamb by a string. We were told that they take their pet lambs out into the fields as companions, and they keep them in their rooms at night. The first villages one passes is Salona, when on the extensive ruins of a Roman city of that name, the “Pompeii of Dalmatia.” Then come the “Sette Castelli,” seven small castles along the shores of the bay built by the Venetians as outposts against the Turks. Round each castle a village has grown up, the houses of some forming an uninterrupted line. They are much frequented by the people of Spalato as a summer villeggiatura. At the north end of the bay Traù comes in sight. The town is built on a small island in a channel between the mainland and the larger island of Bua, and is connected with both by means of bridges. It is the most mediaeval town on the coast, and within its walls nothing has altered for five hundred years. Over the Porta di Terraferma the ever-watchful Lion of St. Mark guards the entrance, embowered in a cypress bush which springs from between two stones over the gateway; round this bush many legends are gathered. The streets are narrow and dark, the only open space being the Piazza del Duomo. The stately and sombre thirteenth-century cathedral with its massive piers, mellow brown in tone, fine but sober sculptures, and its superb porch, is a splendid specimen of mediaeval architecture. Opposite is the open Loggia whence the rulers of the town dispensed justice in public. There are other churches Romanesque, Gothic, and Renaissance, and many a fine old Venetian palace; but one of Trau's most attractive features is the riva towards Bua. It is a broad quay faced by a row of palaces, gate-towers, and fragments of walls. At the sea-ward end is the imposing Castello Camerlengo, now in ruins. The island of Bua, unlike the opposite mainland, is very bleak and stony and typically Dalmatian. It served in Roman times as a place for the relegatio in insulan, and one can easily imagine the feelings of an exiled Roman, wandering about the sterile hills and valleys of the island meditating on the delights of the Urbs and the fickleness of princely favour. We travelled from Spalato to Ragusa by night and so did not see much of the islands near the former place, nor of the peninsula of Sabbioncello, the only spot in Europe, with the exception of the neighbouring island of Curzola, where the jackal is still to be found. One lands at Gravosa and drives across a narrow peninsula to Ragusa, for the harbour of that once famous maritime republic is too small for steamers of any size. Taken altogether Ragusa is the most attractive town in Dalmatia. Its position is unrivalled, the vegetation more luxuriant even than that of Spalato, its streets are wide and stately, and its buildings, if inferior to a few others in the country, bespeak a queen among cities. It would need a volume to tell of all the many beauties of Ragusa, of her wonderful history, of her successful diplomacy, her art, her culture, the graceful Rector's Palace, the Sponza, the splendid circuit of walls. The town is built on a promontory and a narrow strip of coast between the Monte Sergio and the sea. One broad main thoroughfare goes right through it, some streets climb up the steep hillside, while others descend to the water's edge. The walls were built partly by Dalmatian architects such as Orsini, and partly by Michelozzo Michelozzi and other Italians. Ragusa is rich in monasteries, among which that of the Franciscans and that of the Dominicans with their shady cloisters are particularly beautiful. The former has a charming little garden in a sort of second cloister, with the old pharmacy under the loggia. In this garden the simples for the chemist's decoctions were grown, and there are still some curious instruments lying about—a large green pressing machine, a range for preparing medicines, &c. The costumes at Ragusa are gayer and more brilliant even than at Spalato or Zara, and more Eastern. Here too one sees still stranger costumes from the Herzegovina, and the bright embroidery and the red slippers in the shop windows, show that we are still nearer to the Orient. Ragusa, too, is an excellent centre for excursions, but we have no more space to tell of them. Ragusavecchia, Ombla, the Isola di Mezzo, Cannosa all show us different aspects of Dalmatian scenery, and everywhere we find palms, cactus, and other semi-tropical plants, besides cypresses, vineyards, olives, and cornfields. And in every garden, almost in every field, graceful little columns of marble or stone are used as supports or merely as ornaments. In some places I have seen whole avenues of them. It is a peculiar and charming custom of the Ragusan campagna, said to be of Spanish origin. After Ragusa comes Cattaro, hidden at the end of the Bocche, gloomy, forlorn, and desolate, with steep mountains coming sheer down to the water's edge. Beyond again is the last strip of Dalmatian coast with the towns of Budua and Spizza. Then the wild shores of Montenegro and barbarous Albania.